The Yellow Pages industry is pretending to be consumer friendly this week now that a bill is flowing through the Minnesota legislature that’s designed to give state residents more control over which yellow page books end up on their doorsteps. Let’s take a look at the reality of the situation. That’s it. Only two lines long. That tells search engines that they shouldn’t read anything on the website. Imagine if someone could Google for terms like “ypassociation Minnesota” to find out what the YP Association has said about Minnesota in the past. You can’t, because the industry doesn’t want you to. Buried within the non-indexed site is a page that lists the phone numbers of yellow pages companies that can be used to opt-out of their directories. They’ve made this page inaccessible by Google, Yahoo, MSN, and Ask.com, so they probably don’t want people to really know about it. Wow, sure sounds nice. 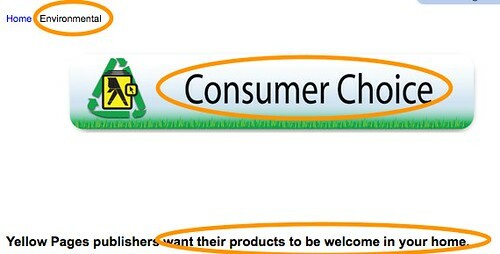 An environmental page that claims to be consumer friendly and gives people a choice about what types of print spam they’re willing to tolerate. How refreshing. Oh my. The industry that claims to be environmentally sensitive and consumer friendly won’t accept opt-out requests from sites designed to allow people to opt-out of all phone books using a single form. Yellowpagesgoesgreen.org is an example of this. So the industry says they’re cool with you opting out of phone book delivery. Yet they won’t accept opt-out requests from consumers unless consumers take the time to contact each and every company that drops a piece of print spam at their door. Local yellow pages advertisers: Are you paying attention? Do you get what this means for you? It means you’re paying for the printing, delivery, and taxes on the disposal and recycling of thousands and thousands of books that are never used. And the yellow pages company is working hard to make sure you continue to pay for advertising that will never be seen. If the yellow pages truly cared about local advertisers, they would do everything they could to make sure ONLY people who plan to use the yellow pages would receive yellow pages. Until yellow pages companies start treating local businesses with respect, local businesses should redirect their marketing dollars to industries that are focused on providing value to businesses rather than inflating distribution rates. I know that the cost to place an ad in the Yellow Pages is based upon the number of directories delivered. If you take Minneapolis Minnesota for example, and you look at the Dex Yellow Pages, they tout almost 1 million printed copies of their directory that are delivered. They bang the advertisers over $30,000 for a half page ad in that directory because of it. Imagine what would happen if all of a sudden 20% of the people in the city didn’t want that directory anymore? It would destroy their entire sales model. For an opt out system, the publishers we have spoken to said that they would be willing to accept opt out information from a 3rd party source, provided that it is verifiable. They still want to self regulate, but it is a step forward. So if there are guidelines in place, and the publishers are working to assist people in opting out of receiving their directories, why it is taking legislation being put into place to make sure it happens? Maybe it has to do with the 23% profit cash cow that these directories represent. If I made almost a $7,000 profit on every half page ad sold in my directory, I guess I would fight tooth and nail too to make sure all of the copies are delivered whether people wanted them or not. Pingback: Why Local Businesses Need Mobile Marketing | Teamwork Makes The Dream Work!